After a soothing Stardew Valley session you may think, ‘hey, this ol’ agriculture lark isn’t all that hard, I could be a real farmer’. Eric Barone’s charming farming simulator lets you escape the exorbitant property prices of the big city and transform a fixer-upper plot into a heavenly garden at your own leisurely pace. But what if you had greater concerns than insidious boredom and sudden business-destroying tariffs? What if your green-fingered paradise was threatened by menacing mutants and the small matter of all-out nuclear annihilation? This is a question at least one person in the world has. “I was playing a lot of Stardew Valley,” developer Danny Wynne tells me. “So I was going down into the caves, coming back, and doing my farming, going back and forth. 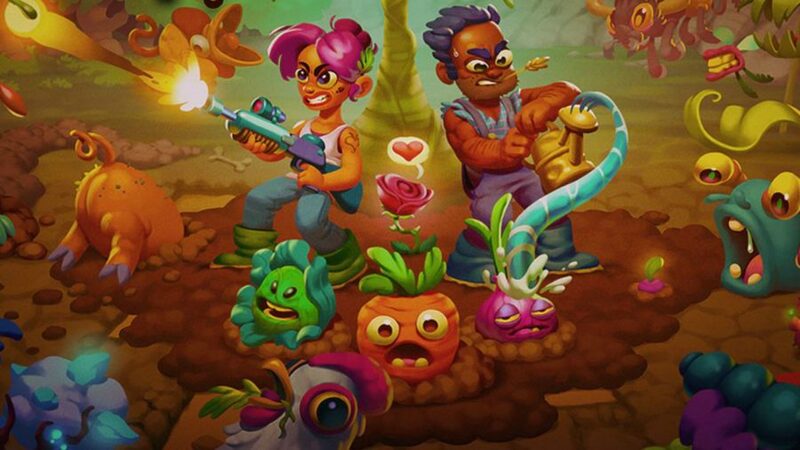 And I was thinking, ‘what if I could just do these things and fight at the same time?’.” Atomicrops, an action-packed roguelite farming sim, is the delightfully anarchic answer. 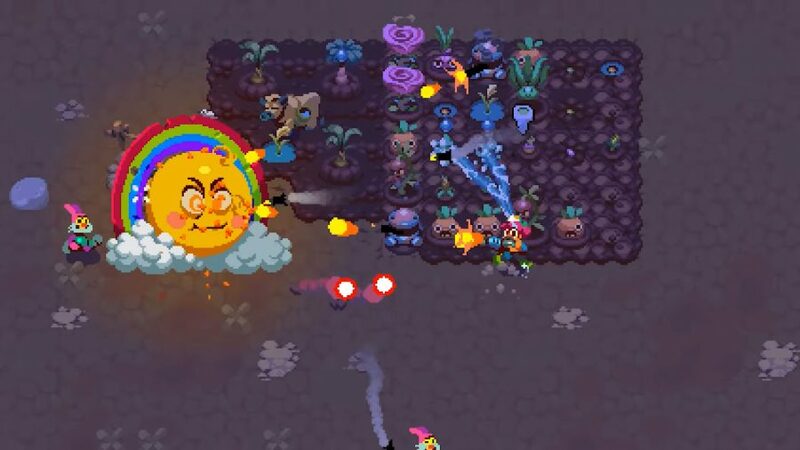 In a tongue-in-cheek nod to the team’s chief inspiration, you inherit your grandfather’s farm – but, in this game, he’s been zapped into dust by a nuclear blast. In other words, Stardew fans, this isn’t the shrub tinkering and neighbourhood nattering experience with which you’re familiar. As the only farm and farmer standing, it’s up to you to venture into the ravaged rural wilderness to plant enough food for the smattering of survivors that remain. You really do have the weight of the world on your shoulders; it turns out that a mutant invasion is even more concerning for a farmer than Brexit… probably. Planting and fighting is like tapping your head and rubbing your belly, but with hands covered in gorse, and gore. It’s tough when you need to fight off bouncing pink bunnies – whose cuteness belie their insatiable lust for farmer innards – but that’s nothing, as you even have to show the entire sun who’s boss at one point. What that gigantic ball of flame is willing to give in photosynthesis, it’s more than happy to take away – with unerringly accurate fireballs. Every moment spent idling in Atomicrops is a moment wasted. You must either be fighting foes to gain precious fertiliser, trawl the attractive pixel-art biomes for supplies, or allocating your seeds – not in that way – but preferably all at the same time. When rolling out the Dig for Victory campaign, I don’t think this was a scenario for which the British Ministry of Agriculture had prepared. And that’s just during the day. In a way that recalls indie survival game, Don’t Starve, night time is when the proper baddies crawl out and ooze their way to your farm. Attacks come from all sides and make your plot feel tremendously exposed. If you haven’t done enough to bolster your defences during the day, prepare for your freshly-grown fodder to end up in the distended belly of a slug. You’re not on your own, however: some animals that have avoided mutation can be recruited to automate some of your agricultural chores. You can also trade the plants you managed to scrabble out of your farm back to the town hub for coin. Then you can use that cash to upgrade your arsenal to better beat the beasties that rampage across your plot. Well-placed turrets and more shots for my rifle transformed my fortunes on subsequent runs. Also, if you grow some roses, you can romance and marry NPCs in the hub. But instead of settling down and shaking your fists at clouds together, as you would following matrimony in Stardew Valley, your agronomist beau lends you a hand in battle. As you assemble your crack team and gain mastery over your not-so-idyllic surroundings, you can explore further and discover blueprints, or how-to garden guides, and more efficient gardening tools. Atomicrops is more than just the sum of its mad clash of parts. Your weapons have the satisfying ‘THWUMP’ and precision of Nuclear Throne, and shots land with a satisfying impact. Just when starvation, death, and irrigation difficulties start to become overwhelming, the town hub is a welcome cathartic space. The tranquility of a farming sim and the chaos of a twin-stick shooter should go together like oil and water – both of which the town could probably use, come to think of it – but it works. I’ve definitely now proven I can be both a proper farmer and a soldier of the nuclear apocalypse. Now that’s growth.